Did you remember I am having a girl? Over the weekend I went to my friend Brooke's baby shower. She was my very best friend for a while in Jr. High and High School. We are due only 5 days apart. This was a Macey's in...Clearfield I think. We also got to go to a play over the weekend that my niece and twin nephews were in. My sister (their mom) directed it. It was very well done and I was so proud of all four of them. 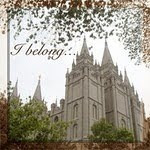 Salt Lake Temple. We had a fun, but long day. I was in totally bliss with all the amazing flowers on Temple square!! just how excited I am about having a GIRL! I am in such shock, I can't even tell you! I was so sure this baby was a boy...I just "felt" it. and I am very happy to be wrong in this case! We are so excited. I can't stop smiling! Now if we can agree on a name it will be a miracle! Watch out pink and frilly...here I come! !